Fall is right around the corner, but if you’re like us, you’re holding on to every last bit of summer possible! This month’s signature cocktail will make the transition to the fall season even easier. The September signature cocktail is a Blackberry Bourbon. If you’re looking for a drink to incorporate the last bits of flavors and warmth of the summer season, then this is the drink for you. As usual, this cocktail is super simple but is sure to impress. Host an end of the summer party and make this for your guests. We promise they’ll love it! Check out the recipe below. Start off by muddling blackberries in a shaker. This will get all the delicious juice out of the berries! Add the bourbon, brandy, lemon juice, simple syrup and ice. Pour into your favorite glass and top it off with club soda. Give it a little stir and it’s ready to serve! 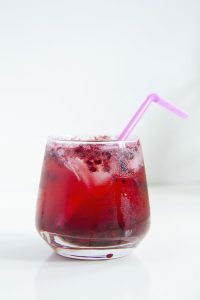 *Tip – If you like to drink your cocktails with a straw, you might get little bits of blackberry come up the straw. To prevent this, simply strain the blackberries when you muddle them before mixing cocktail!